Celebrate the outcome of this historic election of the 45th president of the United States! 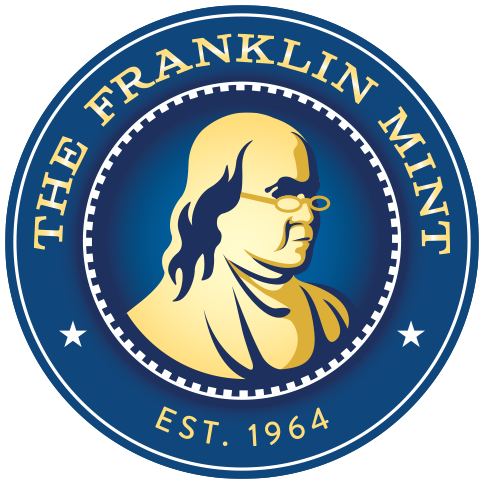 For the first time in 2016, the 45th President of the United States is being featured on a set of four genuine, legal tender U.S. coins that were struck at the U.S. Mint: three out-of-issue State Quarters that are colorized* with portraits of the President, the President and Vice President, the President and First Lady and a 2016 Kennedy Half Dollar. The Half Dollar is a 2016 coin, while the 2001 NY State Quarters represent Trump's home state and the IN State Quarter represent Trump's running mate, Mike Pence, the Governor of Indiana. The colorizing is the highest quality in the world and is accomplished through a revolutionary, patented technique. The colors are life-like. This coin is not available from the U.S. Mint. 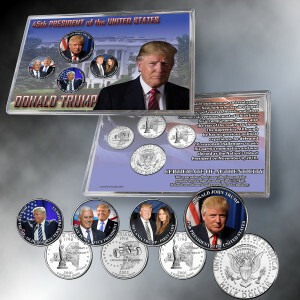 They are genuine Half Dollars that are struck by the U.S. Mint, but the Mint does not have the capacity to colorize coins. Comes in a metal box display. Trump is a billionaire businessman and real estate developer from New York who has developed casinos, golf courses, hotels, and other commercial ventures, most of which bear his “Trump” name; he was also the star of the reality TV show, The Apprentice. Although he has no previous political experience, he defeated 16 seasoned challengers to win his party’s nomination and was elected as the Nation's Oldest President on November 8, 2016. The election was on November 8, 2016, and the inauguration is on January 20, 2017. POTUS 45 coins are beautiful. I have them displayed proudly in our home. Just now my little Grandson is starting his coin collection. It was he that gave me the idea to purchase these coins.. They were not expensive and fit well within our budget. I hope by purchasing them we have done our part to Make America Great Again.